Jibe Media: Blog | Baconlicio.us - Go Grease Your Friends! Baconlicio.us – Go Grease Your Friends! I’ll admit, I’m a victim of dinky websites that just do something simple and cool. I enjoy seeing what ideas other people come up with that relate to my line of work. Most of said sites are useless int he real world, but just fun to see and use. Just last week a new one came to the surface called Baconlico.us. The domain name is genius, but what does it do? 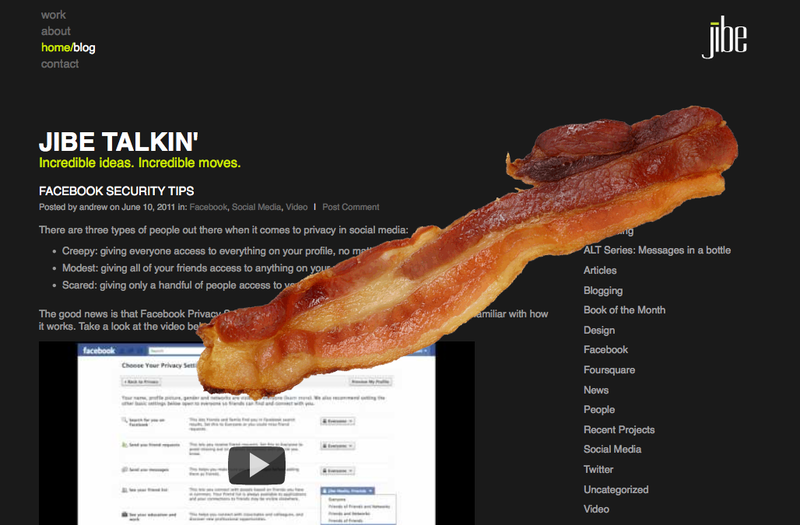 It allows you to “baconlicious” your website, which is to apply a large slab of bacon atop any website on the web (well, almost any!). I think this link may help explain. Neat, huh? This is a great way to play a trick on a co-worker, especially when working on the website is what you do on a regular basis. The day that I came across this I sent that link around to everyone in the office disguised as a link to our website. The reactions I got were, “Andrew, what did you do?” or “How did that get there?” I’m pretty sure the best reaction was from Bethany just laughing due to the fact that she wasn’t sure why I would want to put a slab of bacon on our homepage. Classic. To play jokes on your co-workers just do one of the following, enter baconlicio.us/YOURWEBSITEHERE in your address bar or drag this link to your bookmarks bar to Baconlicio.us any website that you are on! Happy baonlici.us-ing!